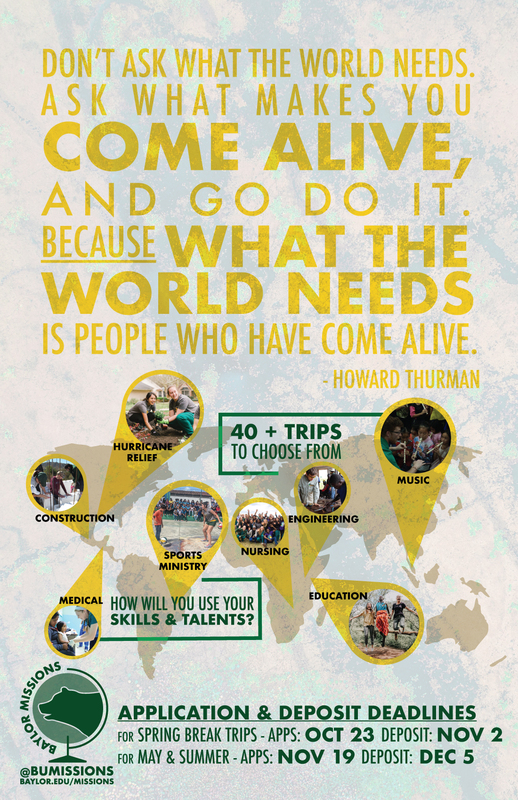 Got a specific area of the world you'd like to serve with Baylor Missions? Search for trips that fill your passport & fit your passions! Find an global experience that combines your FAITH with SERVICE and discipline-specific LEARNING. Whether it's stateside or world-wide, Baylor Missions is excited to provide Baylor students, faculty and staff with 50 discipline-specific mission trip opportunities to over 20+ different locations for Fall Break, Winter Break, Spring Break, May Mini-Mester, Summer I & 2! Try "Spring Break", "Haiti", "Accounting", or select "All Opportunities" to see all our teams!